OBJECTIVE To compare the prevalence of spinal abnormalities found on magnetic resonance imaging (MRI) in symptomatic surgical candidates and non-surgical patients. SETTING A single academic spine surgery practice in Toronto, Ont. PARTICIPANTS A total of 1586 symptomatic patients referred during a 32-month period; based on chart review, patients were classified as surgical candidates (n = 722), non-surgical patients (n = 690), or indeterminate regarding surgical candidacy (n = 174). MAIN OUTCOME MEASURES Prevalence rates of different spinal abnormalities between the 2 cohorts, including type, severity, and number of levels of abnormalities detected on lumbar MRI. RESULTS The total number of abnormalities did not differ between the 2 groups (P = .26). The non-surgical group exhibited more degenerative disk disease (P < .01), while surgical candidates had a higher prevalence of spinal stenosis and spondylolisthesis (P < .01). In multivariate analysis, age (adjusted odds ratio [AOR] per 10-year increase 3.33, 95% confidence interval [CI] 3.32 to 3.33), disk herniation (AOR 1.49, 95% CI 1.16 to 1.89), spinal stenosis (AOR 1.61, 95% CI 1.26 to 2.05), and spondylolisthesis (AOR 2.83, 95% CI 2.08 to 3.88) were independent predictors of surgical candidacy. CONCLUSION These results might enable physicians without specialty training in spinal disorders to more effectively use MRI reports when deciding on referral to surgical or non-surgical specialists. In jurisdictions with long wait times for elective spinal surgery consultation, a more directed referral is one of many steps necessary to improve patient access and management. Despite this body of evidence, our anecdotal experience suggests that many referrals to spine surgeons are prompted by spinal abnormalities seen on MRI, rather than based on the correlation between patients’ symptoms and their imaging results. However, to our knowledge, no study has examined among symptomatic patients the relationship between the burden of spinal MRI abnormalities and the patient’s likelihood of being deemed a surgical candidate. This information could enable referring physicians to more confidently identify surgical or non-surgical candidates among their patients, thereby improving referral patterns to non-surgical specialists for earlier assessment and management of non-surgical patients, while also optimizing the use of limited spinal surgery consultation time. Accordingly, we compared the total amount, type, severity, and number of intervertebral levels of abnormalities present on spinal MRI between surgical and non-surgical patients with lumbar symptoms. A retrospective cohort study was conducted on all patients (N = 2021) referred to see an adult-spine surgeon at a university-affiliated tertiary care institution for assessment of their lumbar spines between September 2005 and April 2008. This study included both patients who were clinically assessed and patients who were not seen because the information provided at the time of referral suggested they would be very unlikely to be surgical candidates. Patient charts without MRI scans were excluded. Other exclusion criteria included referrals for neoplasia, infections, or acute traumatic conditions. A chart review was conducted to abstract patient demographic information, patient disposition, and the radiologist reports of the MRI scans. Patient disposition was determined on the basis of the surgeon’s clinical evaluation, classifying individuals as either non-surgical patients (unassessed individuals and assessed patients with conditions not amenable to surgery), surgical candidates (defined as those whose clinical status would have been amenable to surgical intervention at any point—including those who declined, deferred, or underwent surgery), or indeterminate regarding surgical candidacy. However, as the study’s purpose was to compare the surgical and non-surgical cohorts, patients classified as indeterminate were excluded from the primary statistical analysis. For each patient, we extracted data from the radiologist’s official MRI report regarding the presence of 6 specific types of abnormalities (Table 1) at each of the 5 disk levels in the lumbosacral spine. We then calculated the total number of abnormalities across all disk levels as well as per category of abnormality. For those with disk herniation or spinal stenosis, the severity of morphological change (if reported by the radiologist) was classified as either mild to moderate or severe. Finally, the number of levels in the lumbar spine altered by disk abnormalities in each patient was recorded. Statistical analysis was performed using SAS, version 9.1. To compare the 2 cohorts with respect to the prevalence of the total amount and types of structural abnormalities, a Mann-Whitney test was performed. Using a multivariable logistic regression model, adjusted odds ratios (AORs) and 95% confidence intervals (CIs) were estimated to describe the relationship between different spinal MRI abnormalities and patients’ surgical candidacy. In addition, for patients whose severity of disk herniation or spinal stenosis was noted by the radiologist, a separate multivariable model was constructed to determine the relationship between severity and surgical candidacy. To assess the effect of excluding indeterminate patients, we conducted sensitivity analyses in which we independently included the indeterminate patients in either the non-surgical or surgical group. P values of less than .05 were considered statistically significant. Of 2021 potentially eligible patients, 435 were eliminated from review—196 because of missing MRI information and 239 because they met other exclusion criteria. Hence, the study examined a total of 1586 individuals, 753 of whom were men (Table 2). The mean (SD) age of the patients was 55.2 (15.1) years (range 18 to 95). Of the 1586 individuals, 722 (45.5%) were deemed surgical candidates, 690 (43.5%) were non-surgical, and 174 (10.9%) were classified as indeterminate regarding their surgical candidacy. Of the 722 surgical candidates, 411 (57.8%) had spine surgery. Baseline characteristics and MRI abnormalities among surgical and non-surgical patients: Mean (SD) age of surgical and non-surgical patients was 57.4 (15.5) and 52.4 (14.2) years, respectively. Patients with indeterminate surgical status were excluded from the analysis. 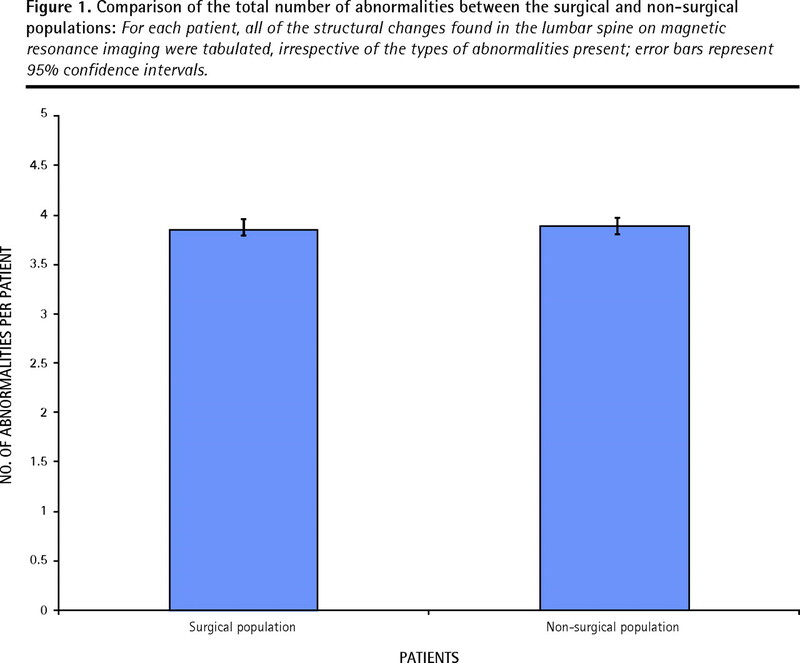 The total number of abnormalities per patient did not differ between the surgical and non-surgical cohorts (P = .26) (Figure 1). The prevalence of different imaging abnormalities on MRI are presented in Table 2. Notably, non-surgical patients exhibited a higher prevalence of degenerative disk disease, while surgical patients had a higher prevalence of instability and spinal stenosis (Figure 2). 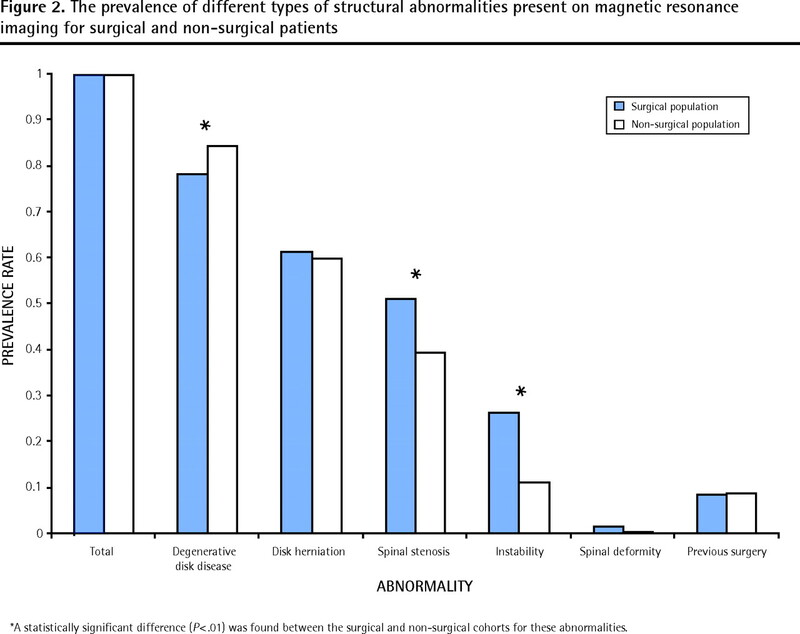 Comparison of the total number of abnormalities between the surgical and non-surgical populations: For each patient, all of the structural changes found in the lumbar spine on magnetic resonance imaging were tabulated, irrespective of the types of abnormalities present; error bars represent 95% confidence intervals. A total of 71.1% of those presenting with instability and 57.5% of those with spinal stenosis were eventually classified as surgical candidates, while those with degenerative disks (49.1%) and disk herniation (51.6%) had a lower probability. Among patients for whom disk herniation or spinal stenosis was reported to be severe, the likelihood of being classified as a surgical candidate increased to 68.2% and 75.0%, respectively. In a multivariable logistic regression model, several factors were independent predictors of surgical candidacy (Table 3). These included age (AOR per 10-year increase 3.33, 95% CI 3.32 to 3.33), disk herniation (AOR 1.49, 95% CI 1.16 to 1.89), spinal stenosis (AOR 1.61, 95% CI 1.26 to 2.05), and instability (AOR 2.83, 95% CI 2.08 to 3.88). The number of abnormal lumbar spine levels was inversely correlated with surgical candidacy (AOR 0.79, 95% CI 0.71 to 0.88). For example, a patient with 5 levels of morphological change was 3.29 times less likely to be a surgical candidate than another patient presenting with only 1 level of anomaly in his or her lumbar spine. For patients in whom severity was reported, a second multivariable model found that patients with either severe disk herniation (AOR 3.38, 95% CI 2.00 to 5.71) or severe spinal stenosis (AOR 2.31, 95% CI 1.50 to 3.57) were more likely to be surgical candidates (Table 4) compared with those with mild to moderate findings. Finally, the sensitivity analyses for which indeterminate candidates were included in either the non-surgical group or the surgical group did not lead to any important changes in the multivariable model results (data not included). In this study we found that most patients with lumbar symptoms will concurrently manifest several different types of abnormalities on MRI—most commonly degenerative disks, disk herniation, and spinal stenosis. This high prevalence of MRI abnormalities of uncertain clinical significance among symptomatic patients makes decision making about surgical or non-surgical referral and management a challenging process. Nonetheless, we found that patients with MRI findings of severe disk herniation, severe spinal stenosis, and instability had the greatest odds of being surgical candidates. These findings correspond with the conclusions from the recent Spine Patient Outcomes Research Trials (SPORT), which compared surgical and non-surgical treatments of both lumbar spinal stenosis and degenerative spondylolisthesis.7,8 For both conditions, the benefits of surgical management for those with concordant leg-dominant symptoms (claudication or radiculopathy) in reducing pain and enhancing functional status were significant at all assessment intervals up to 2 years. Another limitation of this study is that among those with disk herniations, the severity of the morphological changes was noted in fewer than half of the cases. While this information about disk herniations is absent from the reports of a substantial proportion of surgical and non-surgical patients, we believe that it is unlikely that the radiologist would fail to report the presence of a severe disk herniation if one were indeed present. The findings from this study emphasize the importance of correlating MRI findings with the patient’s clinical presentation.6 In particular, some of the terminology frequently cited within MRI reports, such as “severe diffuse degenerative disk” or “indentation of the cauda equina” are understandably interpreted as “very serious” by both patients and their health care providers alike. The “alarming” MRI report combined with the patient’s symptoms can often precipitate a surgical referral. Given that wait times for spine specialist consultations often range from several months to more than a year in Canada,20,21 strategies to decrease unnecessary referrals and improve access for patients who will benefit most from surgical consultation is desirable. The findings of this study could help to address this issue, as this is the first paper to our knowledge that has investigated whether the prevalence of specific MRI abnormalities differs among patients who at any point in time were eligible for surgery relative to non-surgical patients. As a result, referring physicians can utilize this assessment of MRI parameters to better facilitate their decisions about surgical versus non-surgical spine specialist referral. This study found that specific findings on MRI reports were independent predictors of surgical candidacy. These results might enable physicians without specialty training in spinal disorders to more effectively use MRI reports when deciding on referral to a surgical or non-surgical specialist. In jurisdictions with long wait times for elective surgical spinal consultation, a more directed referral is one of many steps necessary to improve patient access and management. We thank Ms Oma Persaud, MSc, for her assistance in the research ethics board submission process and her logistical support for this study. This study was funded principally by The W. Garfield Weston Foundation. Dr You is also supported by a Career Scientist Award from the Ontario Ministry of Health and Long-Term Care. The high prevalence and uncertain clinical relevance of abnormalities on spinal magnetic resonance imaging (MRI) makes decision making about non-surgical or surgical referral a challenging process. This study demonstrates that specific findings on MRI reports were independent predictors of surgical candidacy. Referring physicians can use this information to more confidently interpret the results of their patients’ MRIs and provide more directed referrals to the appropriate surgical or non-surgical specialists. Comme l’imagerie par résonance magnétique (IMR) décèle une quantité importante d’anomalies dont la signification clinique est souvent douteuse, il peut être difficile de décider si une intervention chirurgicale est indiquée. Cette étude montre que les résultats de l’IMR constituent des facteurs de prédiction indépendants pour une chirurgie éventuelle. Muni de cette information, le médecin traitant peut interpréter les résultats de l’IRM de façon plus confiante et, selon le cas, diriger le patient en spécialité chirurgicale ou non chirurgicale. All authors were responsible for designing all aspects of the study. Mr Cheng completed the data collection and an independent epidemiologist performed the data analysis. The first draft of the manuscript was written by Mr Cheng; Dr Rampersaud and Dr You reviewed and revised all subsequent versions. All authors approved the final manuscript submitted for publication.
. The 1995 Volvo Award in clinical sciences. The diagnostic accuracy of magnetic resonance imaging, work perception, and psychosocial factors in identifying symptomatic disc herniations. Spine (Phila Pa 1976) 1995;20(24):2613-25.
. The symptomatic lumbar disc in patients with low-back pain. Magnetic resonance imaging appearances in both a symptomatic and control population. Spine (Phila Pa 1976) 1993;18(13):1808-11.
. Lumbar degenerative disk disease. Radiology 2007;245(1):43-61.
. Magnetic resonance imaging of the lumbar spine in people without back pain. N Engl J Med 1994;331(2):69-73.
. Abnormal magnetic-resonance scans of the lumbar spine in asymptomatic subjects. A prospective investigation. J Bone Joint Surg Am 1990;72(3):403-8.
. Associations between patient report of symptoms and anatomic impairment visible on lumbar magnetic resonance imaging. Spine (Phila Pa 1976) 2000;25(7):819-28.
. Surgical versus nonsurgical treatment for lumbar degenerative spondylolisthesis. N Engl J Med 2007;356(22):2257-70.
. Surgical versus nonsurgical therapy for lumbar spinal stenosis. N Engl J Med 2008;358(8):794-810.
. Lumbar spinal stenosis: conservative or surgical management? : a prospective 10-year study. Spine (Phila Pa 1976) 2000;25(11):1424-35. discussion 1435–6.
. Failure of conservative treatment for lumbar spinal stenosis in elderly patients. Arch Gerontol Geriatr 2007;44(3):235-41. Epub 2006 Jul 25.
. Surgical vs nonoperative treatment for lumbar disk herniation. The Spine Patient Outcomes Research Trial (SPORT): a randomized trial. JAMA 2006;296(20):2441-50.
. Degenerative lumbar spinal stenosis: correlation with Oswestry Disability Index and MR imaging. Eur Spine J 2008;17(5):679-85. Epub 2008 Mar 7.
. Percent spinal canal compromise on MRI utilized for predicting the need for surgical treatment in single-level lumbar intervertebral disc herniation. Spine J 2005;5(6):608-14.
. The significance of spinal canal dimensions in discriminating symptomatic from asymptomatic disc herniations. Eur Spine J 2002;11(6):575-81. Epub 2002 Aug 28.
. Value of the magnetic resonance imaging in patients with painful lumbar spinal stenosis (LSS) undergoing lumbar epidural steroid injections. Clin J Pain 2007;23(7):571-5.
. Perioperative complications of posterior lumbar decompression and arthrodesis in older adults. J Bone Joint Surg Am 2003;85-A(11):2089-92.
. Risk factors for the development of perioperative complications in elderly patients undergoing lumbar decompression and arthrodesis for spinal stenosis: an analysis of 166 patients. Spine (Phila Pa 1976) 2007;32(2):230-5.
. Variation in surgical decision making for degenerative spinal disorders. Part I: lumbar spine. Spine (Phila Pa 1976) 2005;30(19):2208-13.
. Systematic review of randomized trials comparing lumbar fusion surgery to nonoperative care for treatment of chronic back pain. Spine (Phila Pa 1976) 2007;32(7):816-23.
. Access to spine care: a tale of two cities. Can J Neurol Sci 2008;35(3):308-13.
. The impact of surgical wait time on patient-based outcomes in posterior lumbar spinal surgery. Eur Spine J 2007;16(11):1832-9. Epub 2007 Aug 14.
. The cost-utility of lumbar disc herniation surgery. Eur Spine J 2007;16(3):329-37. Epub 2006 May 9.
. Prolonged conservative care versus early surgery in patients with sciatica caused by lumbar disc herniation: two year results of a randomised controlled trial. BMJ 2008;336(7657):1355-8. Epub 2008 May 23.